.......Tai Chi is a Chinese exercise that uses slow, smooth body movements to relax both body and mind. ........It's an interesting experience and I used to know some people who did it fairly regularly and they found it very relaxing. 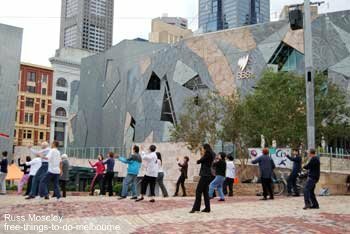 The only downside with this class is a lot of people may gawk at you as its held in Federation Square! ....it's not too common a sight here in Melbourne though. Go and watch if you don't like the thought of being stared at. I found it quite relaxing! .......It's an ideal way to start your day if you're one of those normally stressed, rushing city commuters! I believe that if it's raining they go undercover into The Atrium to do it so it's a regular weekly event. 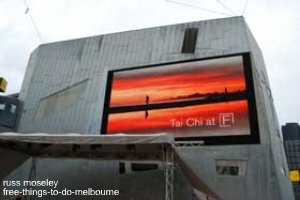 ..........see Australian art at The Ian Potter Centre: NGV Australia or head off for a nice walk along the Yarra River checking out the aborigine artwork at Birrarung Marr.